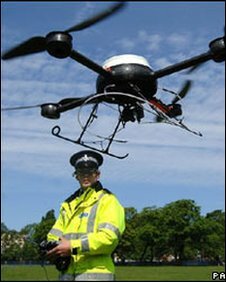 Police on Merseyside have made their first arrest using thermal imaging cameras on the force's drone. The technology on board the Unmanned Aerial Vehicle (UAV) tracked one of two men suspected of stealing a car in the Bootle area. The equipment is directed on remote control by an officer on the ground. The thermal images were used to track down the two men after they ran off from the car. One hid in undergrowth and was tracked by the drone. The technology on the drone meant its operator was able to use live images of the suspect's body heat and direct patrols on the ground to where he was. The other man was arrested as soon as he got out of the stolen car. 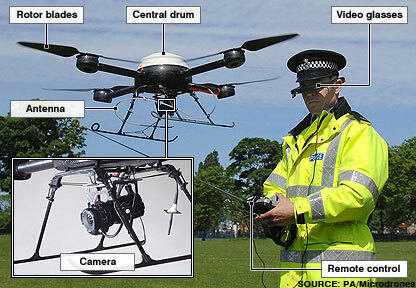 Merseyside Police says it is the only police force in the UK to operate a UAV. It is the first time since it was introduced last November that the specific use of its thermal imaging camera has led to an arrest. Ch Insp Nick Gunatilleke said: "The force is continually looking to use new technology to help in its fight against crime and these arrests demonstrate the value of having something like the UAV as a resource. "In this case the UAV's thermal imaging camera was particularly helpful in identifying where one of the suspects was hiding by detecting the body heat he was giving off. "It also has a wealth of other technology on board and we will use it whenever we can to support other resources such as the force helicopter and dog patrols in dealing with incidents when they arise." The machine is 1m wide, weighs less than a bag of sugar, and can record images from a height of 500m. The two men arrested have been released on police bail.